The local Education Bureau introduced us to Dong Jianhong in 2011. Small and sickly, he is 10 y.o., currently studying in 4th grade of primary school and 2nd of his class (1st in English). His mother was already expecting him when she married his mentally ill father. She went away soon after, leaving her son in his grand-mother’s care and left. He has been supported by Children of Madaifu since 2012. Cao Hongbin used to live with his younger brother and his younger sister, both heavily disabled. Their father died of pneumonia in 1997. Their mother left in 2002 and hasn’t shown any sign of life since. Alone with a deaf-and-dumb grand-mother, he was, at the age of 13, on the verge of dropping out of school when we offered him to join a vocational training school in Baoji (Shaanxi) where he prepared to enter the professional world. He now works in a furniture factory in Xi’an and has a stable salary allowing him to take care of his family who stayed in the village. When we first met him, Han Yaqiang was 12 years old and had already lost both his parents. His mother committed suicide in 1996 and his father died of diabetes a few years later. He was still living with his older sister. Because of bad school results, he left middle school and went to Xinjiang to work as cotton-picker. The association then encouraged him to join a bakery training programme with Shanghai Young Bakers. He will graduate in 2013, joining the four other “Children of Madaifu” who have already become professional bakers. Among them, Zhang Zhenhai who, top of his class, went to Aurillac to finish his studies and get his diploma. 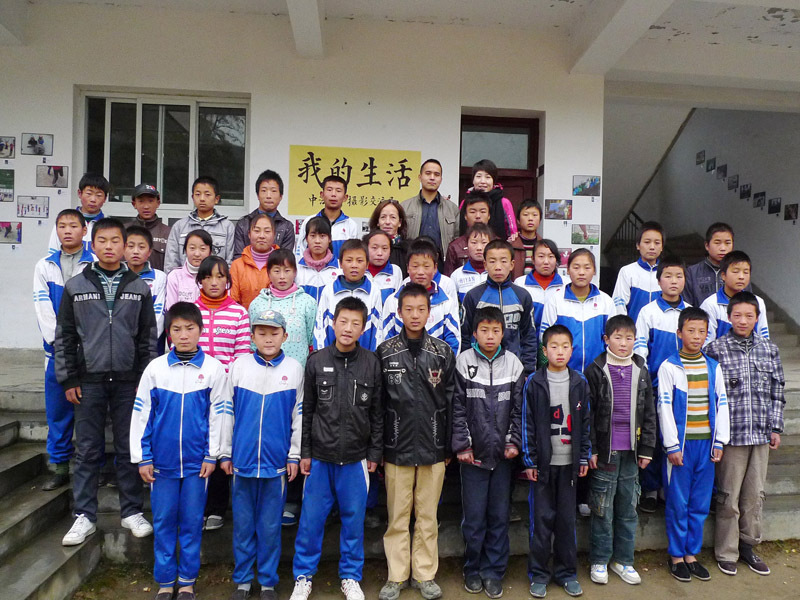 Jing Baoyu was 15 years old and was in 3rd year of middle school when his headmaster informed us of his situation. Despite his good grades, his grandparents simply couldn’t afford his high school fees. His father died of stomach’s cancer in 1995. His mother left the following year. If he passes his final examination, he would like to join Tianshui Normal University and become a teacher. Tan Xiaofang has been supported by the association since she was 7 years old. When we first met her, her schizophrenic father could not work anymore and her mother had left. Since then, she lost her grandfather, in 2007, then her father, in 2011. An average student, she is studying all the harder should enter high school in september 2012. She lives near the Shanmen Bathhouse and is always happy to go and give a hand there. Wang Juan is 24 years old. Her father died in 2003 of liver cancer and her mother remarried. When we met her, she was 16 years old and lived with her uncle and her cousin. As she was brilliant, her uncle decided to remove his own son from school to be able to afford Wang Juan’s studies. She joined Wuhan’s university in 2007 thanks to the sponsoring of a friend of Children of Madaifu’s, and is currently following a Master degree in environmental sciences. 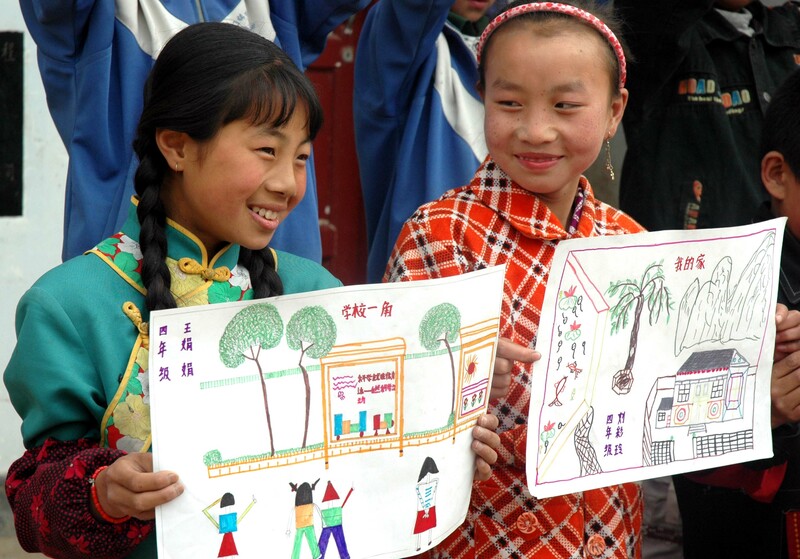 Cécile Isnard, correspondent in Lyon for Children de Madaifu, took the lead of this drawings exchange between the French schools of Saint-Pierre de Chartreuse (Isère) and Pouzols ( Hérault) and the Chinese schools of Shanmen, Guanshan and Gaoqiao in Gansu. She went on site in May, 2008 to exchange the drawings, which were then exposed, in France as well as in China. 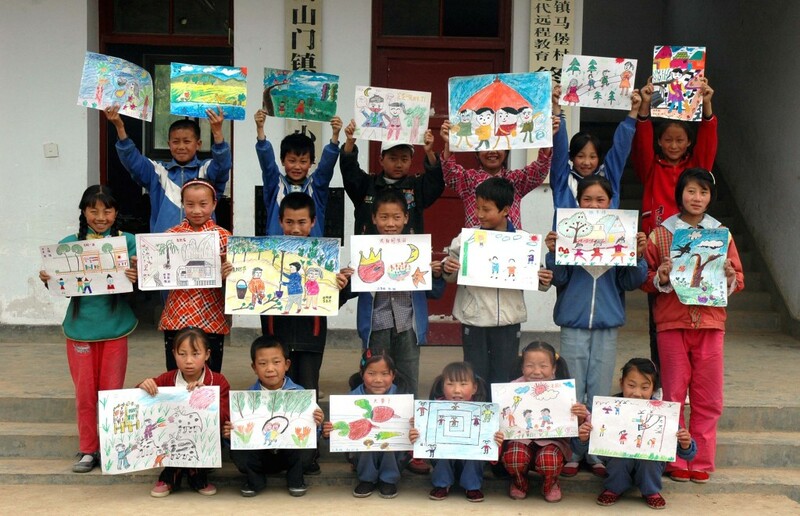 Two 2nd grades classes of the French Lycée in Beijing focused on solidarity in 2009/2010. Their teacher, Mrs Ziegler, asked some of our volunteers to present the organisation to her students, who then organized the Christmas Apples’ selling in their high school. 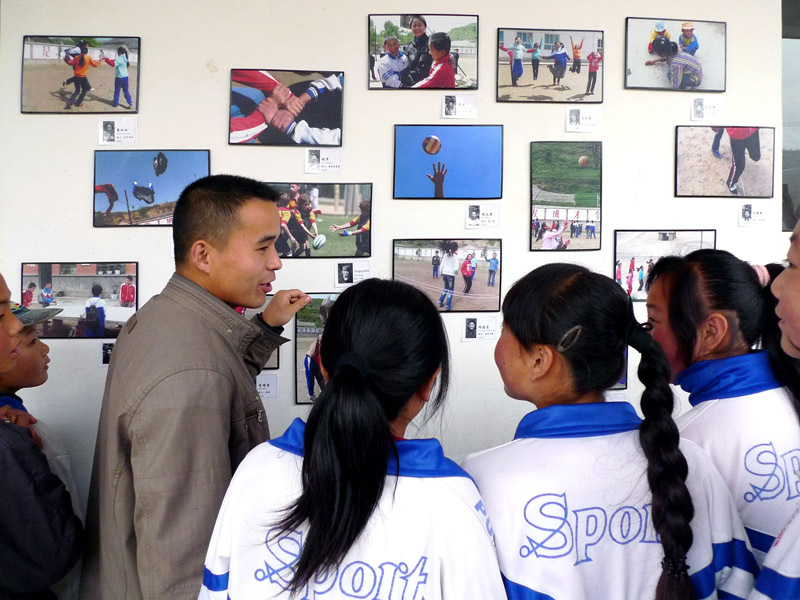 To set up a common project between this high school and a middle school’s first grade class in Shanmen ( Gansu), the artist Wen Fang gave the same photography course to these two classes. By following the theme she chose – ” My life ” – a hundred of children contributed and took pictures representing their daily life. 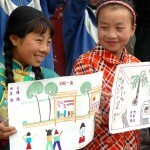 In Shanmen, the association offered two cameras so that the children could participate. 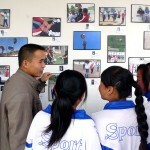 Gathered in an exhibition at the French Lycée of Beijing in June 2010, these photos were brought to Gansu in autumn and were exposed in Shanmen’s middle school. The 200€ resulting from the sale of the pictures were donated to their class to organise a project of their choice (excursion, sports day…).